The key to avoiding vinyl siding replacement is to keep your vinyl looking its best. Most homeowners don't undertake a new vinyl siding project due to storm damage or deterioration. 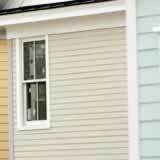 The cause of most vinyl siding replacement is the unsightly nature of dirty and stained siding. Damage and deterioration do take their toll but vinyl siding prices will be lower throughout the life of your home if you never have to replace it. These approaches alone will give disappointing results. Cleaning your siding requires some simple equipment you should have on hand before you begin. Considering high replacement vinyl siding prices, this equipment is a cheap investment. Start at the top of your home with a strong spray setting on the pressure washer and work your way down. Thoroughly clean every square inch of surface including trim, fascia, and corner guards. Evenly spray the siding with special attention to trouble spots, the underside of panels, and crevices. Just getting vinyl wet and moving on won't dislodge grime, mold, and moss. Rinse siding from the top down to remove all soap and dirt. Run plenty of clean water through the power washer to hit the same spots you sprayed with soap. Scrub persistent stains with a bristle brush and dish soap. Rinse thoroughly and dry with a cloth to check your work. If the rag becomes soiled during drying, repeat the scrubbing and rinsing process. Washing vinyl siding is the most overlooked way to keep vinyl siding prices down where they belong.